Mostly clear. Low near 60F. NNW winds shifting to ENE at 10 to 15 mph..
Mostly clear. Low near 60F. NNW winds shifting to ENE at 10 to 15 mph. 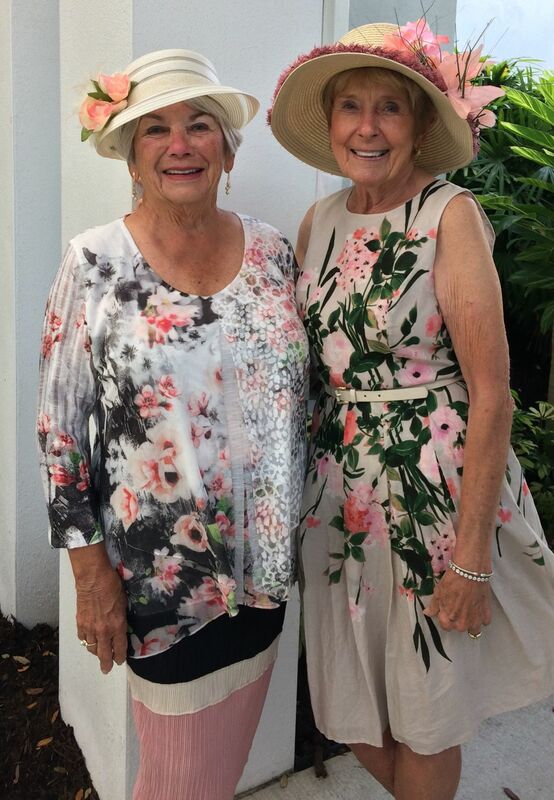 Pat Magennis and Marlys Roslansky said their role was to smile and welcome guests to the Plantation Foundation’s Garden Party luncheon and fashion show. They did a great job. Pete Petrie and Donna Kubik welcomed and thanked volunteers and guests to the Garden Party luncheon and fashion show. Pete is president of the Plantation Community Foundation. Donna chaired the spectacular Garden Party luncheon and fashion show. JoAnne Britton and Maryann Melus know fashion show luncheons are fun. Maryann was one of the Garden Party volunteers. They all wore lovely hats. Paula Dawson always volunteers or chairs Plantation Foundation events. Judy Mooney, Sue Ermelin and Marsha Sayder get ready for an afternoon of fun at the Plantation Golf and Country Club. Peggy Donoghue and Judy Thuer enjoy a friendly visit before lunch at the Garden Party luncheon and fashion show. Judy was one of the models in the show. Ginny Borgia modeled one of the more colorful outfits of the afternoon. Zeddie Pitt drew a round of applause from the audience at the Garden Club luncheon and fashion show. Whitney Sale showcased stripes, noted to be must haves for spring. From left, Renee Dees, owner of St. Marco Boutique; Lisa Vander Wall, owner of Lisa’s Classic Rose; Norhala Houck, owner of the Sun Bug and Twist; and Sandy McGowan, owner of Sandy’s Designer Clothing, showcased clothes from their shops at the Plantation Community Foundation’s Garden Party luncheon and fashion show. Each owner also offered a discount of future purchases within a week of the show. Color, flowers and well-organized fun gave everyone at the Plantation Community Foundation Garden Party fashion show and luncheon a feeling of good energy. Chair Donna Kubik and her committee made sure members wore colorful hats with flowers, and attached to their 50/50 raffle basket was a balloon signaling their location for quick ticket sales. The spectacular centerpieces were bouquets of live flowers created by Garden of Eden. They were for sale after the show. President of the Plantaton Community Foundation Pete Petrie welcomed “People who wish to make a difference.” He told about the Foundation members wanting to improve the quality of life in Sarasota County. This year the Plantation Community Foundation would be presenting $200,000 in grants to the community. Donna read a long list of thank yous as it was clear an event as spectacular as the fashion show and luncheon took many hands, months of planning and strong, determined leadership. The silent auction baskets and individual items punctuate the generosity of this community. Donations equaled thousands of dollars. One of the neat hallmarks of the show was the Stevie Wonder song, “Isn’t She Lovely.” The music created a nice feel-good mood. Donna Kubik and her team deserve a huge pat on the back for a colorful fashion show and luncheon making everyone who attended feel lovely. Some of our bestThe special people of this week are Renee Dees, Lisa Vander Wall, Sandy McGowan and Norhala Houck. These business owners showcased their clothes at the Plantation Community Foundation luncheon and fashion show. Facing the stress of the Venice Beautification the retailers made time for outreach to participate in the Plantation Garden Party fashion show and luncheon. These women take part in most fashion shows in the area. They secure models, help choose clothes, hire a helper for the show, transport clothes to the show and return them to the shop. All the while leaving employees to continue to conduct business. It is a big job. They deserve a hand for their work and for bringing joy to the hundreds who attend the shows. Their generosity adds to the nonprofits, creating successful fundraisers that provide grants and scholarships for the community. All the while our Venice retailers maintain their own lives with family and friends. Renee Dees, Lisa Vander Wall, Sandy McGowan and Norhala Houck help make Venice a great place to live. Fran Valencic is the social columnist for the Venice Gondolier Sun. She welcomes your tips and ideas. Contact her at franvalencic@comcast.net.